The perfect addition to any party or get together. 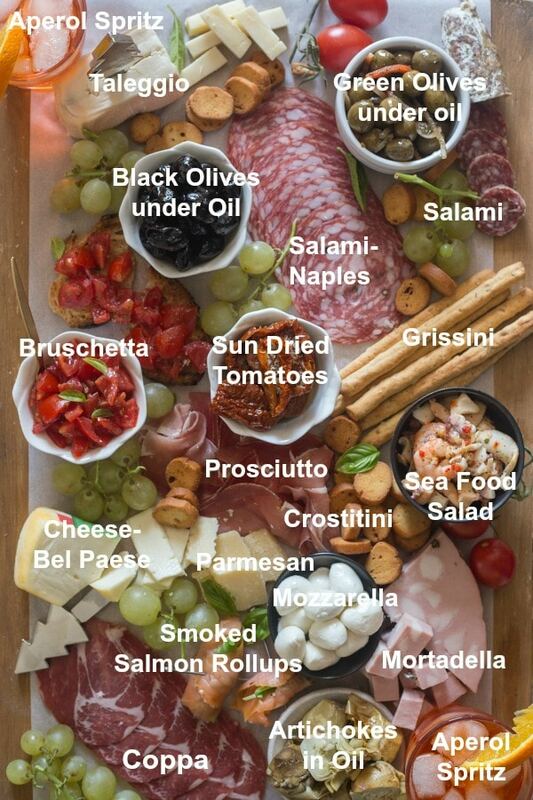 This Italian Antipasto Cheese Board is easy to put together and holds all the delicious Italian finger foods that guests love to eat. This Antipasto Cheese Board all started out because of a drink! An Aperol Spritz to be exact. I was talking about this with my husband and a few other people, and I discovered that everyone had tasted this but me! So needless to say I had to try it too. The original recipe calls for 1 part sparkling water or tonic, 2 parts Aperol and 2 parts Prosecco with lots of ice and a slice of orange. Naturally the Italian said that’s not right, because then it becomes much too watery. So we experimented a bit and came up with the perfect Aperol Spritz, which is 1 part Aperol and 2 parts Proseco, no Tonic and only 2 ice cubes with a slice of orange. So good. My new favourite cocktail! Of course then I thought what would I serve with this Drink? 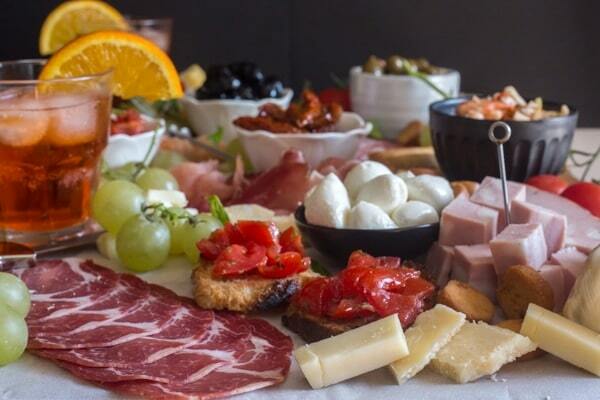 A delicious Italian Antipasto Cheese Board came to mind. 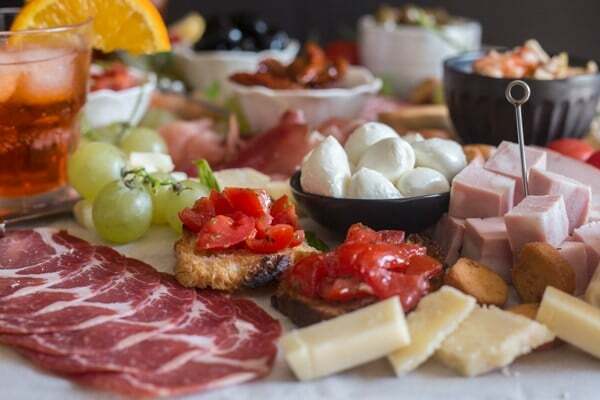 What Ingredients are needed for an Italian Antipasto Cheese Board. 4-5 different types of meat, for example, Salami – Naples, small sliced Salami, Mortadella, Prosciutto and Coppa (Lonza). 3-4 different types of cheese such as Mozzarella, Parmesan, Bel Paese and a very soft spreadable cheese such as Taleggio. A delicious simple Bruschetta is something everyone loves. A couple of different types of Olives, simple black olives under oil and maybe a more spicier green olive under oil. An easy Seafood Salad, a plate of Dried Tomatoes under oil and of course one of our favourites Artichokes under oil. Serve it all with your favourite Italian bread, Grissini and crackers of choice and of course don’t forget some fresh grapes. And of course do’t forget the Aperol Spritz. Of course not everyone is going to want to drink a cocktail so another alternative would be Wine or even Beer, have a couple of selections and everyone should be satisfied. Not a drinker, then a sparkling water with a slice of lemon is a great choice, or a juice Spritzer, you are going to want to serve something not overly sweet. What exactly is a Charcuterie Board? It is a meat board with no cheese involved, so I suppose you could call this Italian Antipasto Board a Charcuterie Cheese Board. 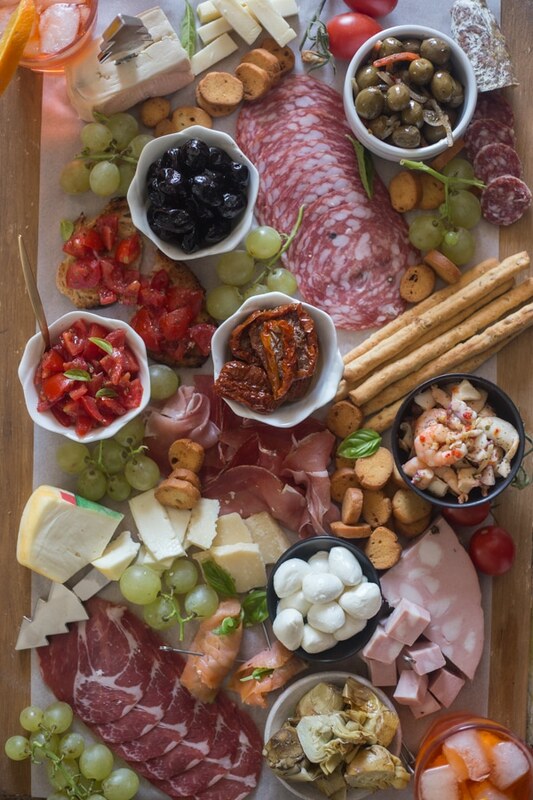 So if you are celebrating in a big way or even a little smaller I hope an Antipasto Board will be part of your celebration! Enjoy. you might enjoy the official Aperol brand recipe of 3-2-1: 3 parts Prosecco, 2 parts Aperol, and 1 part soda water. Have you seen the catchy commercial on TV? Hi Maura, yeah I tried it first with the soda water, but I wasn’t too thrilled by it, I prefer without. 🙂 And yes the commercial started it all.